Developer Quote: "Vocabulary and Grammar! will get your child ready for school with these fun grammar and vocabulary learning games for kids in Preschool and Kindergarten! 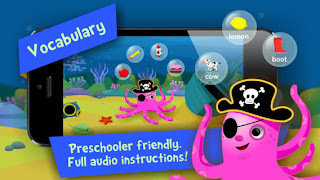 Your child will learn and practice key language skills such as vocabulary, listening comprehension and sentence formation while playing with lovely underwater animals!" One crucial element of early childhood education is introducing your child to a character they come to know and love. As you begin teaching your child the 3 "R's" and more, they will enjoy and favor learning whatever the task with their familiar, beloved character. Such is the case with that cute little character, Boing, who has traveled on many a happy adventure with your child in the "i Learn With Boing" series. In this new episode by the experienced child educators, Tribal Nova, Vocabulary and Grammar ! Language development educational games for kids..., children ages 3 to 6 will enjoy new summer activities at the seaside that help them increase their learning skills. Every child loves the beach and under-the-sea adventures which are popular in movies and on TV. Now kids can discover and practice vocabulary, comprehension and forming correct sentences with Boing and his ocean friends in this early learning, language, educational, children's iPad app! Game 1 - The Octopus! : This is a Hidden Object game in which your child will assist the octopus in locating the special objects that are carefully hidden. The octopus will use these items to juggle much to your child's delight! Visual senses are needed here. Objective: Grouping objects based on their characteristics or uses. Game 2 - The Clown Fishes! : An important fundamental here is simply to Follow the Instructions and place the clown fish on the correct spaces in order to see them dance. Your child will giggle with glee to see fish dance! Objective: Learning about spatial sense and directions. Game 3 - The Crabs! : Grammatical elements are incorporated here as your child forms a sentence by placing the crabs in the correct order. Once done correctly, the sentence will be represented by a dance of the crabs! This activity can be shared and enjoyed by two. Objective: Understanding grammatical order in sentences. I began the game with the Octopus activity as Boing directs kids to find hidden objects. This requires some thought as objects are placed behind items in the sea. When Boing requests you to find a ball, bike, or other item which is not readily visible, simply tap each piece of scenery until you discover it. Sometimes there is a clue as you see a shadow barely visible behind the sea habitation. Note that you can scroll to the right to find additional scenery in which to hunt your hidden objects. You will need to upgrade with the 99 cent In-App option to play the 2 remaining educational games. When you play with the Clown Fish (or Listening Comprehension activity), you will be directed to locate the clown fish in specific spots such as "in front of", "behind the", next to the" etc. As you tap that area, the fish will pop up, snazzily dressed in costume! This is a great exercise in following Instructions and also increasing knowledge of names of items. 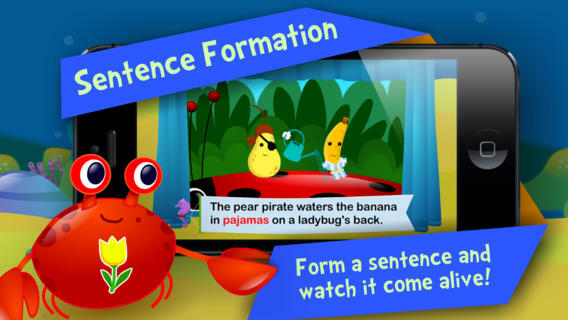 Sentence Formation (the game with the colorful Crabs) offers you the choice of playing alone or with someone. Level 1 starts off with placing the crabs in the correct order. Match the color crab to the spot on the sand to make a special sentence. Each crab will have an item image on their shell. When the crabs are lined up in order, the images will actually spell out a sentence such as, "The lollipop kisses the shovel!" Tap the green conch shell for a lively dance animation by these crusty crustaceans! You can't help but smile and admire this crab show! - New parental gate to keep your kids within a safe environment! This feature provides parents with a new security step for a better playing and learning experience for your child. - Parents can decide which level their children should start playing at. The chosen level will depend on the mastery each child has on a specific subject or skill. As your child plays and learns, the clock is ticking measuring progress. InVocabulary and Grammar ! Language development educational games for kids..., the sea world is a wonderful kaleidoscope of colors that kids will enjoy. Soft music plays in the background, and if you don't finish your activity within the allotted time frame, Boing instructs you to start again. In the helpful Parents Center, follow your child's learning in all 3 areas of Vocabulary, Listening Comprehension and Sentence Formation to see the knowledge increase over 3 levels. This lively, thoughtfully planned educational game is a lovely addition to your child's learning instruction. It is quite a delight to see them happily involved with the sea creatures while thoughtfully considering every tap representing a facet of their enjoyable education! COOL CONCLUSION: Enjoy the satisfaction and happiness your child experiences while learning the fundamentals of language, vocabulary, observation and more while playing the colorful and clever Vocabulary and Grammar ! Language development educational games for kids in Preschool and Kindergarten by i Learn With!" --iOS/Age Rating: This app requires iOS 4.3 or later. Optimized for iPhone 5. Rated 4+. --NOTE: Try the 1st level of all the games for FREE! Unlocking the full version will require a single in-app purchase.